Now that we are moving away from SQL Express in favor of vPostgres for vCenter simple install on Windows and since vPostgres is the default database engine for (not so simple) install of vCSA I thought it would be nice to learn how to backup and restore this database. drwx------ 2 root root 4.0K Jun 3 19:41 .
drwx------ 3 root root 4.0K Jun 3 19:28 .. I logged back in the WebClient and my folder was back, so mission accomplished. I saved it as “backup_vcdb” and made it executable with “chmod +x backup_vcdb”. This basically means that the system will execute the script every day of every week of every year at 11pm. drwx------ 2 root root 4.0K Jun 3 19:46 . You will also have the log files of these backups in “/var/mail/root”. If you followed my previous posts you know how often and how useful is to SSH into a virtual appliance in Horizon Workspace and most of the time the commands you issue need to be run as ‘root’. This can be annoying in particular using SCP to copy files because you are limited to ‘sshuser’ home directory and this force us to log back in as ‘root’ again to move the files we just copies. In actuality there is a way to enable ‘root’ access straight from SSH to make things faster. WARNING: I’M DESCRIBING THIS PROCEDURE FOR THE SAKE OF LEARNING BUT BY NO MEANS I SUGGEST TO DO THIS IN PRODUCTION BECAUSE IT WILL MOST LIKELY VIOLATE YOUR SECURITY POLICY. Now you can log in as ‘root’ directly from SSH. In the previous posts we’ve taken care of all the preparation steps so now we should be ready to get down to business and install Horizon Workspace. First of all download the Horizon Workspace OVA from the VMware website and get a product key; trial is good if you didn’t purchase one yet and it should be ok for proof-of-concept. Once you have the OVA file you can import it in vCenter using the usual “Deploy OVF from template” menu. Note: You must have created the reverse zone in DNS before using this flag. Otherwise you can manually create PTR records in the reverse zone. If you followed previous posts you should have no problems filling up all the information. Make sure all virtual appliances are on the same network segment. During setup the name of the virtual appliances will be assigned based on reverse lookup query of every IP address so it’s important to also to create PTR records because A records are not used for DNS reverse lookups and if they are missing the setup process will fail. In my case i don’t have a specific timezone for my country but since i live in GMT+1 i can choose Paris. If you don’t know what to choose or make the wrong choice here you can change it later on and you will also have more options to choose from. The date command in the beginning and end are useful to see if the operation was successful. Note: When you get to the end of the wizard remember to check the flag so that the vApp is powered on after deployment. The interesting thing to note here is that the suggested FQDN would be the same name of the gateway that we set in the DNS records, but we want to put this out on the internet so we are choosing “workspace.myvirtualife.net”. Remember: the FQDN cannot be changed after deployment. The only supported option to change it is redeploying the whole thing from scratch. Note: You need to use a valid SMTP server or setup will stop. Grab something to drink, make phone calls… this takes a while. At the end you will be instructed to press enter and connect to the configurator-va via HTTPS. Admin user is a local user that can access the configurator appliance in case of problems, but it’s not the Horizon Workspace administrator. Fill up licensing details and click “Next”. Now, this is where it gets interesting! Crap. Error again. A different one. I know it doesn’t look like it but we are making progresses here. At this point i understood why the setup wanted me to use the gateway-va FQDN as Workspace FQDN. Our problem now is that the “workspace.myvirtualife.net” hostname doesn’t match with the common name of the certificate that has been generated for the gateway-va which in my case it “gateway01.vsphere.lab”, but we need something that can be used outside on the internet so what do we do now? Whooa! Finally. You don’t know how much it took me to figure this out. No really, stop guessing. You don’t WANT to know. Another option i could think of is to configure the load balancer before setting up Horizon Workspace, and point “workspace.myvirtualife.net” record to it but it think it’s not practical to set up a load balancer if the application is not up yet because you would have no way to test it. Later on we will complete the job configuring load balancers, changing DNS entries to point at them and generating new certificates that are not self-signed so all pieces fall into place. More on these activities in later posts. Configure using your Active Directory LDAP structure. The user ‘workspace’ is a user i created earlier in Active Directory and that is the user that will function as Horizon Workspace admin. Accept defaults for user mapping. Note: If you see an error tab it’s most likely because you didn’t compile fields Name, Last Name and Email for all users. Click “Add” next to the Active Directory groups that you want to add to the Horizon Workspace. For SSL certificates just leave defaults and click “Next”. In the “Select Modules” page enable all modules but the View module and click “Next”. Note: The password was set on the user when it has been created in Active Directory. Congrats! You’ve setup Horizon Workspace and in the coming posts we will complete the job installing load balancers, taking care of SSL Certificates and so on. In the last post i described in details how to prepare a vPostgres DB to host Horizon Workspace external database. During the installation process, as we will see, you can choose to use an internal database or an external one but keep in mind that the internal database is ment only for testing purpose so if you are installing Horizon Workspace in a production environment you must have a VM with vPostgres installed as this is the only supported configuration, so you can understand why the first post was needed. So now we are ready to install Horizon Workspace… well, not quite yet. It is very important to understand that to install this product there are number of preparation steps that need to be taken before actually getting our hands dirty and start having fun. Some of those steps include filling up some technical prerequisites and some are just decisions that need to be taken keeping in mind that during the installation phase there are some settings that cannot be changed afterwards unless redeploying the entire solution. This is something you definitely don’t want to find out after you’ve performed all the installation and configuration tasks and then have to start over again. In this post we are going through all the prerequisites so with that out of the way we will be able to easily proceed with the deployment phase, but first let’s talk about the Horizon Workspace virtual appliances and their respective functions. The following is taken from the official documentation. VMware Horizon Workspace Configurator Virtual Appliance (configurator-va): You start configuring Horizon Workspace with this virtual appliance, using both the Configurator virtual appliance interface and the Configurator Web interface. The configurations you make with the Configurator are distributed to the other virtual appliances in the vApp. Note: The configurator-va is the only component that cannot scale to multiple instances. VMware Horizon Workspace Manager Virtual Appliance (service-va): Horizon Workspace Manager handles ThinApp package synchronization and gives you access to the Administrator Web interface, from which you can manage users, groups, and resources. 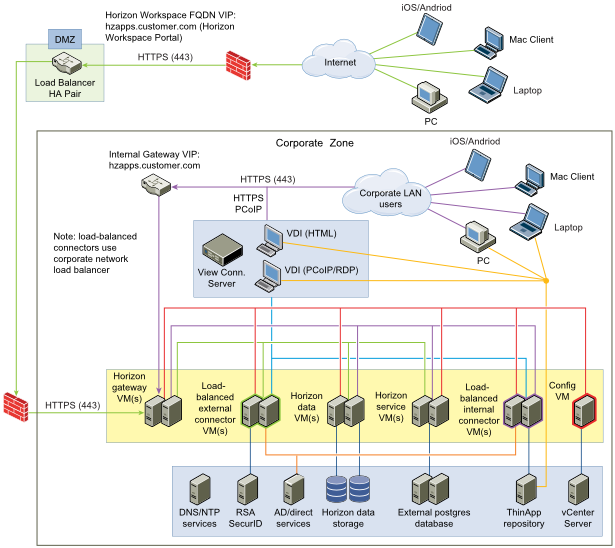 VMware Horizon Workspace Connector Virtual Appliance (connector-va): Horizon Workspace Connector provides the following services: user authentication (identity provider), directory synchronization, ThinApp-catalog loading, and View pool synchronization. VMware Horizon Workspace Data Virtual Appliance (data-va): Horizon Workspace Data Virtual Appliance controls the file storage and sharing service, stores users’ data (files), and synchronizes users’ data across multiple devices. VMware Horizon Workspace Gateway Virtual Appliance (gateway-va): Horizon Workspace Gateway Virtual Appliance is the single endpoint for all end-user communication. User requests come to the gateway-va virtual machine, which then routes the request to the appropriate virtual appliance. 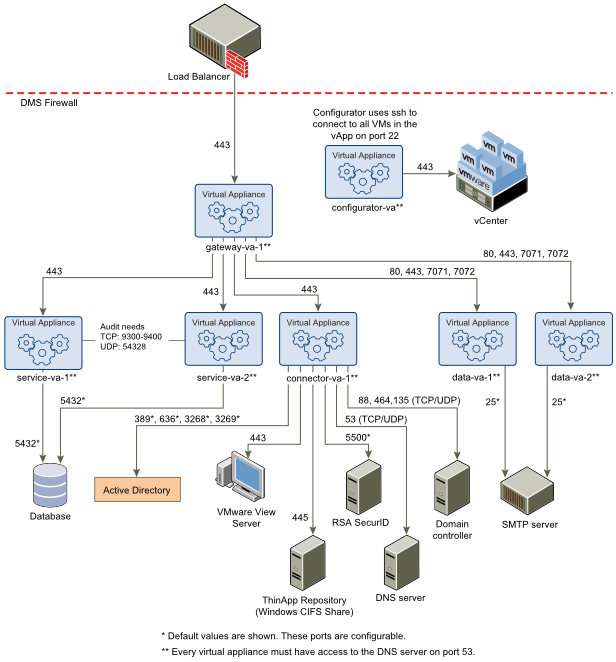 This picture (which is taken straight from the public documentation of the product) shows that every connection from users accessing the Horizon Workspace portal have to go through the Horizon gateway VM(s). The “(s)” easily shows how you can have one or multiple Horizon gateways, in which case you will also need some sort of load balancing mechanism in front of the gateways. The Horizon gateway virtual appliance runs nginx as web server that basically proxies every connection to the desired service so users actually need connectivity only to the gateways virtual appliances. IMPORTANT: Placing the gateway VA in a separate network such as a DMZ network is not a supported configuration. As you can see all communication go into the gateway VA and out to the other virtual appliances which are actually providing the services. Users will connect exclusively in HTTPS and the same is true also for most of communication between virtual appliances, so we will need to work a bit on SSL certificates at some point but it’s not mandatory in the setup phase as you can see form the above list since it is marked as optional in the prereqs. Choosing the FQDN is a tricky one because once you input it during the setup you can’t go back and change it, so it definitely deserves some thinking or you might find yourself redeploying from scratch. Most companies choose to have the same FQDN for both internal and external connections which makes it perfectly transparent for users to reach Workspace no matter where they are located; obviously the FQDN will resolve with a public IP for external users and with a private IP for internal users, hence the need of two sets of load balancers as you can see in the first picture. Just write down TCP/IP configurations that you intend to assign to the five virtual appliances, including DNS configuration. I encourage you to use consecutive addresses for simplicity. Honestly this is a little obscure to me. IP Pools are used as a set of IP addresses that you define and assign to a network in vCenter so that they can be used when you deploy a vApp. Funny is the fact that those addresses must not be the ones you will use for setting up the virtual appliances. Even funnier is the fact that if you deploy the vApp from the Web Client you don’t even have to create an IP Pool. I have no problems admitting my ignorance here on the usefulness and meaning of this step. Self explaining. Since Horizon Workspace integrates with your Active Directory you will need to have IP address, basic parameters and credentials handy during the setup. Just keep in mind that your users in AD will need to have Name, Last Name and email address compiled before importing them in Horizon Workspace or the import will fail. This is used by users when sharing documents. Note that you must specify a working SMTP since a check is performed during the setup and you won’t be able to proceed otherwise. I like to deal with this after the initial deployment and this is another tricky one, so during the setup we will use default self-signed certificates for simplicity. For a proof-of-concept you can request a trial key that will work for 100 users. When using Microsoft documents in Horizon Workspace web portal you can get a preview without having Microsoft Office installed. The preview can be generated with a LibreOffice add-on that runs directly on the data-va or they can be generated on a Microsoft Server with Microsoft Office installed; the first is a free option and it’s usually good enough, the latest will grant you a higher level of compatibility but you will have to pay Microsoft licenses. If you read my last post you should know about this already. Now that you have all handy you are ready to install Horizon Workspace.